Our main focus now is trout fishing at this time. The river is at a nice level and clear with water temps in the 50s. Large numbers of salmon, steelhead, and sucker fry are present against the shoreline. Sulphurs, gray drake, and caddis are the prime hatches right now. Suckers are also starting to load up which should make for outstanding trout fishing. Muskegon River Trout feed heavily on the eggs of the spawning Red Horse Suckers. The native fish provide a staple food source for our resident brown and rainbow trout. Trout on the Muskegon River have been feeding heavily on the numerous insect hatches going on right now. The most prolific are the cinnamon sedge caddis and the Gray Drake. These hatches take place in the afternoon and evenings. The Gray Drake spinner fall takes place right at dusk. These hatches offer some of the best trout fishing in Michigan. Over the past several days, Muskegon River Trout fishing has been going well. We’ve been finding larger, hold over trout daily. At least one 20″ plus trout on just about each guided trip. Seems to be good numbers feeding on the sucker spawn. This trend should continue for the next 10 days or so. Trout on the Muskegon River have been feeding heavily on the numerous insect hatches going on right now. The most prolific are the cinnamon sedge caddis and the Gray Drake spinner fall. These hatches take place in the afternoon and evenings. Evening Hatch Fishing Trips. $250 for 4.5 hrs. Ashley displays a gorgeous Muskegon River Brown Trout from the spawn suckers. Sucker spawn is a high protein diet for huge trout. Toby with a beast of a Brown Trout. This time of years offers the best in Michigan trophy trout. Nothing in Michigan gets our guides more fired up than the Muskegon River Sucker Spawn Hatch. 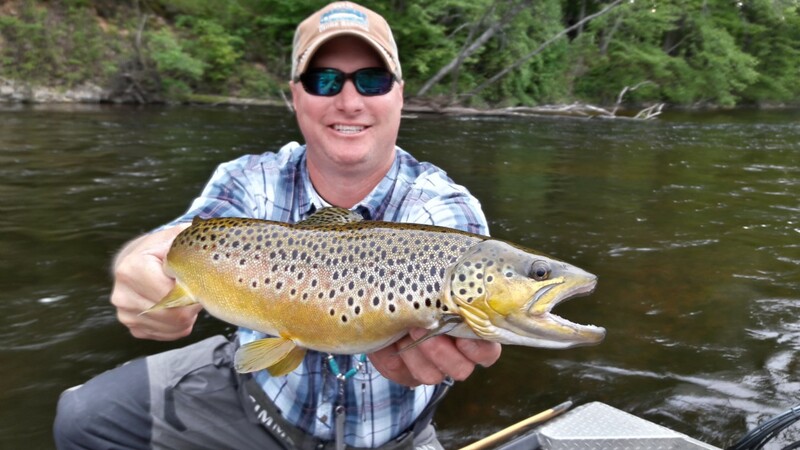 It’s the true Holy Grail for trophy Brown Trout on the Muskegon River. It’s going on right now! Over 100,000 Red Horse Suckers ascend the Muskegon River searching for the perfect gravel shoals in which to drop loads of liquid yellow gold (sucker Spawn). Trophy Trout follow the suckers into the upper stretches of the Muskegon River near Thornapple, Pine St. and finally the Croton Dam. Its a smorgasbord for the trout, an all you can eat, buffet. Big trout gorge and we are here to chase them! With fly rods in hand, we hunt these big trout. The largest trout that the Muskegon River has to offer. Sight fishing to fat Rainbow Trout and portly Brown Trout. You can actually see the big trout behind the sucker redds chowing down on sucker eggs, nymphs, and steelhead fry that are just emerging from the gravel. It’s a riot chasing these big trout – We want you to come along and join us!! We offer both full and half day opportunities! Both Spinning Tackle or Fly Fishing Gear. 1) Yellow Red Horse Sucker Eggs. 2) Freshly emerged Steelhead Fry from the Muskegon River. Steelhead fry hatch or emerge from the gravel about 15 days after the steelhead eggs have been fertilized and laid. Making the perfect for source for Michigan trophy trout.